Dwight Howard’s first preseason with the Washington Wizards is apparently over before it started. If it takes that long, that means Howard won’t appear in any of Washington’s preseason games. And if he doesn’t play in the preseason, that would cast doubt on Howard being ready when Washington’s regular-season slate starts against Miami on Oct. 18. “We’re going to take it day by day,” Brooks told reporters before Washington’s preseason game at New York on Monday night. Howard, who turns 33 in December, has always been durable. He missed a total of seven games in his first seven seasons, and played in 81 of 82 games with Charlotte last season. The one game he missed was while he was serving a suspension — and the Hornets wound up beating Memphis that night by 61 points anyway. But the back problems have kept Howard from practicing or playing with the Wizards so far in training camp and the preseason. For his career, Howard has averaged 17.4 points and 12.7 rebounds — averaging a double-double in each of his 14 seasons as well. Luka Doncic scored 15 points, JJ Barea added 14 and Dallas topped Philadelphia 76ers to earn a split of the teams’ NBA China Games series. Joel Embiid led all scorers with 29 points for Philadelphia. MAVERICKS: Dallas’ Ding Yanyuhang scored one point and got one game ball. The Chinese rookie played the final 8:33, to the delight of the fans in Shenzhen, China. “We know how special this night is for Ding,” Barea said. 76ERS: Robert Covington scored 18 points for the 76ers, who got 10 points apiece from JJ Redick and Ben Simmons. Philadelphia committed 35 fouls for the second consecutive game. UP NEXT: Philadelphia’s preseason ended at 3-1. Dallas (2-1) hosts Charlotte on Friday. Reggie Bullock missed his first eight shots for Detroit, but got a layup — off an assist by Andre Drummond — to fall in the final seconds and force overtime. Drummond tried to send the game to potentially a second overtime, but missed from the left side of the lane with about 3 seconds left in overtime and lobbied unsuccessfully for a foul call. NETS: D’Angelo Russell led the way with 25 points. Caris LeVert and Jarrett Allen each scored 17. PISTONS: Langston Galloway scored 24 points and Blake Griffin finished with 17, on a night in which Drummond had a 14-point, 10-rebound double-double — but missed 15 of his 21 shots. UP NEXT: Brooklyn (1-1) plays Toronto on Wednesday in Montreal. Detroit (1-2) hosts Washington on Wednesday. Kemba Walker scored 20 points for Charlotte, which survived despite seeing what was a 23-point lead get trimmed to three with 1:11 remaining. Jeremy Lamb scored 16 and Cody Zeller added 14 for the Hornets. Zach LaVine led Chicago with 26 points, going 9 for 15 from the field and 4 for 6 from 3-point range. BULLS: Bobby Portis scored 17 points, Antonio Blakeney finished with 15 and Justin Holiday scored 10. … Jabari Parker grabbed 11 rebounds for the Bulls, all of them on the defensive end. Chicago got only four offensive rebounds all game. HORNETS: Malik Monk scored 13 points, Marvin Williams added 12 and Nic Batum finished with 12 rebounds. UP NEXT: Chicago (1-2) hosts Indiana on Wednesday. Charlotte (3-1) visits Dallas on Friday. Victor Oladipo scored 23 points for Indiana, which led by as many as 24 on its way to winning in Cleveland. Domantas Sabonis finished with 16 points and 12 rebounds for the Pacers. Kyle Korver led the Cavaliers with 17 points in just under 20 minutes. CAVALIERS: Cleveland had not trailed for a single second in its first two preseason games. The no-deficit streak ended 22 seconds after tipoff on Monday. … John Holland scored 13 points but first-round pick Collin Sexton struggled — shooting 1 for 7 and finishing with three points. UP NEXT: Indiana (2-1) visits Chicago on Wednesday. Cleveland (2-1) plays Detroit on Friday in East Lansing, Michigan. Rodney McGruder led Miami with 19 points, and a short jumper with 1:35 left closed the scoring. Orlando had a chance to win it after grabbing a defensive rebound and calling time with 1.3 seconds remaining. 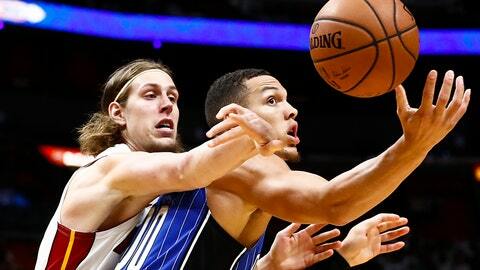 Magic coach Steve Clifford put his starters back in and mapped out a play, but Nikola Vucevic’s lob for Aaron Gordon was knocked away by Miami’s Bam Adebayo and time expired. MAGIC: Vucevic had 22 points and 14 rebounds for Orlando, which rallied from 19 points down and wound up reclaiming the lead in the fourth quarter. Jerlan Grant scored 17 points and Gordon had 12 for the Magic. HEAT: Dwyane Wade made his last home preseason debut, scoring eight points. He’s expected to play in at least one of Miami’s two remaining exhibitions. … Goran Dragic scored 16 points and Hassan Whiteside added 13 rebounds and three blocked shots. UP NEXT: Orlando (1-2) hosts Memphis on Wednesday. Miami (1-3) hosts New Orleans on Wednesday. Bradley Beal led Washington with 20 points, and the Wizards finished with seven players in double figures. It was a rough night for New York’s starting frontcourt. Kevin Knox, Lance Thomas and Noah Vonleh were a combined 3 for 18, finishing with a total of six points between them. WIZARDS: Jeff Green shot 7 for 10 and scored 16 points. John Wall finished with 14 points, nine assists and six rebounds in 27 minutes. KNICKS: Tim Hardaway Jr. and Allonzo Trier each scored 18 for the Knicks, who lost for the first time in this preseason. … Enes Kanter was held out of the game. UP NEXT: Washington (2-1) visits Detroit on Wednesday. New York (3-1) hosts Brooklyn on Friday. Buddy Hield scored 22 points on 9-of-11 shooting, including 4 of 4 from 3-point range, to lead seven Sacramento players in double figures. Justin Jackson made four 3-pointers and finished with 18 points, and Harry Giles III scored 16. Josh Childress, who played eight seasons in the NBA, led Maccabi Haifa with 18 points. KINGS: Kosta Koufos, Bogdan Bogdanovic and Iman Shumpert did not play. … Frank Mason scored 13 points with eight assists and five steals. … Willie Cauley-Stein had 13 points, eight rebounds, seven assists and three steals. MACCABI HAIFA: Kennedy Meeks had 17 points, nine rebounds, four assists and two steals. UP NEXT: Sacramento (2-2) plays host to Utah on Thursday. Deandre Ayton and Ryan Anderson scored 18 points apiece for Phoenix. Stephen Curry led Golden State with 23 points in 23 minutes. Kevin Durant added 12 points, five rebounds and five assists. SUNS: The team announced earlier Monday that General Manager Ryan McDonough had been fired. … Trevor Ariza hit 4 of 8 from 3-point range and finished with 17 points. WARRIORS: Coach Steve Kerr was ejected in the third quarter for arguing a foul called on Stephen Curry. Replays showed Kerr telling the referees, “I don’t want to be here anyway”. … Andre Igoudala, Draymond Green, Klay Thompson and Shaun Livingston did not play. UP NEXT: Golden State plays the Lakers at T-Mobile Arena is Las Vegas, and Phoenix wraps up preseason play at Portland, on Wednesday.